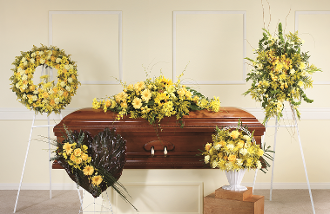 Funeral Flower Arrangement Seven is made with fresh flowers of yellow, cream, white and greens. Made by our dedicated florist for your loved one. Includes Sprays Wreath, Heart and Baskets.